Surrealism was arguably the most important artistic movement of the 20th century in Slovakia as it challenged both cultural and political establishments. 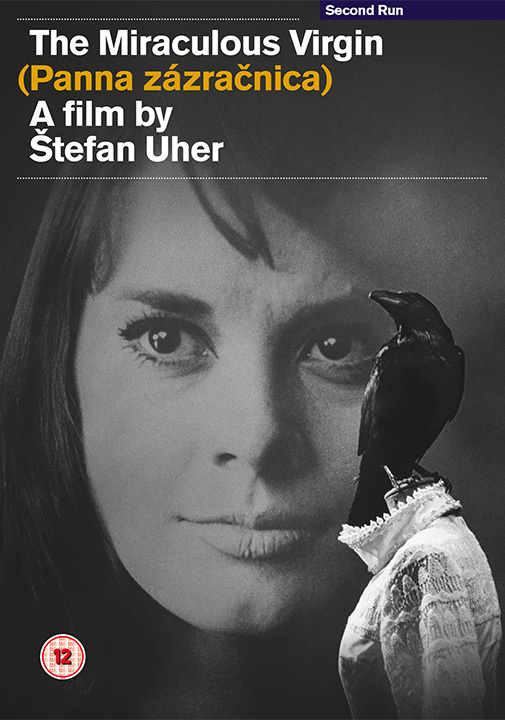 From The Sun in a Net director Štefan Uher, The Miraculous Virgin is an exquisite, surreal, mystery drama set in the art scene of the 1960s became one of Slovak cinema’s most admired and controversial works. Centring on the ‘dream’ figure of Anabella (Knife in the Water’s Jolanta Umecka) who casts her spell on a group of young artists, and the film, through its embracing of fantasy and imagination, becomes a provocation to those only concerned with the material world. Available on region-free Blu-Ray and DVD, The Miraculous Virgin also includes Štefan Uher’s breathtaking 1959 short film Marked by Darkness (Poznačení tmou), plus 'The Story of The Miraculous Virgin', an all new documentary on the film, the talents behind it and its legacy, produced by the Slovak Film Institute; archival promotional documentary ' Looking for Anabella' on the search for the titular lead, and a 16-page booklet with new essay on the film by Michal Michalovič. • Presented from a brand new 2K restoration of the film from original materials by the Slovak Film Institute. • Marked by Darkness (Poznačení tmou) - Štefan Uher’s breathtaking 1959 short film. • The Story of 'The Miraculous Virgin': an all new documentary on the film, the talents behind it and its legacy, produced by the Slovak Film Institute. • Looking for Anabella: an archival documentary on the search for the titular lead. • 16-page booklet featuring new writing on the film by Michal Michalovič. • Region Free (Region '0') DVD. is also available from Second Run. Other classics of Slovak cinema are also available. "The first Czech or Slovak film of the 1960s to expore the common inheritance of Surrealism"
"The Miraculous Virgin is gorgeously fluid, its surrealism expressed most acutely not in the screenplay or the editing, but in the camerawork... The effect is one of constant astonishment, and the shots are like minor miracles [...] every image stirring and exciting, an immersive experience that deserves far more recognition than it has received... The film is poetry, hard to capture in prose"